Medical marijuana will still be tightly restricted, but the law’s approval by the central government is seen as a breakthrough in a country many believed would be last – not among the first – to approve any use of cannabis, even if it is just low-THC to start. The ministry said a series of amended laws passed in a National Assembly session will expand the treatment opportunities for patients with rare diseases. One month into pot legalization, an IPSOS poll looks at what has changed for Canadians including consumption levels and the legal marijuana shopping experience. Frankly, Valleriani says she’s surprised the number of people who say they’ve stuck with their old weed avenues isn’t higher given the issues that have dogged the newly-legal industry. Reports that President Trump is planning to push for legalized marijuana are becoming more often as we approach the midterm elections. President of the United States Donald Trump hasn’t been very popular so far, even though he ran on a populist platform. That platform was based on feelings of fear, anger, uncertainty and most of all—hatred. Hatred towards Muslims, Mexicans and immigrants. It is sufficient to say that he isn’t the most beloved president ever, but there’s a chance he could sneak his way in the top 10 list. Trump’s plan for the second half of his presidency may revolve around getting cannabis federally legalized by the end of his first term. Reports of President Trump planning to legalize recreational marijuana have been circling the news. Many Americans thought that the legalization would have to wait for Democrats to have the full control of the Congress. However, so far we’ve noticed that Trump isn’t a classic partisan president. Going for cannabis legalization seems like a total Trump move. So, let’s take a look at the few important things that happened in the last couple days. The Drug Enforcement Agency released a new assessment on drugs, in which it called for an immediate and undivided offensive against opioids and prescription medicine. Opioid prescriptions in the United States have been on a steady rise for years, and president Trump declared it a national crisis earlier in the year. The DEA reports that heroin-related deaths almost doubled between 2013 and 2016. DEA also noted that the increase in opioid abuse led to a direct increase in heroin abuse and heroin-related deaths. The increase in the abuse of prescription drugs is due to a huge presence of illicit fentanyl and synthetic opioids. Medical cannabis has shown to be a good method for pain management. It is not unheard of that opioid addicts switch to cannabis, in search of a more natural alternative. In fact, in some areas where medical cannabis got legalized, a number of opioid addicts dropped their habit in 6 months or less. Some might say fighting opioids with cannabis is fighting fire with fire, but for some people, it’s a lot better than not fighting at all. Also, during summer, the World Health Organization advised governments around the world to remove CBD from the list of scheduled substances. According to the former White House Communications Director Anthony Scaramucci, Trump is indeed planning on legalizing cannabis after midterms. Anthony Scaramucci worked at the White House, and it is not certain whether this is just his hunch or a real plan on Trump’s behalf. However, he is not alone in those claims. Congressman Dana Rohrbacher (R-CA) is also on the record saying that plans are already in the making. Rohrabacher said in an interview with Fox Business that he’s been talking to people in the White House and Trump’s inner circle. He said that the legalization effort could start as early as spring of 2019. Trump showed support for a bipartisan bill from the Senate which was led by Senator Cory Gardner (R-CO) and Senator Elizabeth Warren (D-MA). One of the major talking points whenever someone brings up the point of federal legalization, whether it’s medical or recreational marijuana, is the “Jeff Sessions won’t allow it” one. US Attorney General Jeff Sessions may be on his way out of the office sooner than what most of us thought. I know I thought he was going to be in office for the whole term. Senator Lindsey Graham mentioned on The Hugh Hewitt Show this week that Attorney General Jeff Sessions might be stepping down after midterms. “Jeff will probably step down. We’ll have a new attorney general most likely early next year, ” senator Graham said. That’s right, the same Jeff Sessions that said a few months ago that “a lot of heroin addictions start with marijuana” is rumored to be leaving office in a few weeks. This is a big part of Trump “setting up the board” for cannabis legalization. Sure, Sessions couldn’t block the legislation in any way or insist on the law to be one way or another, but he could have obstructed it. Sessions wanted to do a huge federal crackdown on marijuana businesses earlier this year, but that didn’t go well. He came down on the states which already legalized marijuana by rescinding the Cole memo, but that didn’t help his cause much as well. My guess is that he finally realized that the general trend of legalizing marijuana is about to hit the federal government too. He didn’t want to be a part of it before he took the job, and he is still one of the strongest proponents of marijuana prohibition. That is why once the legislation is announced I truly believe Senator Lindsey’s words that he’ll resign. After almost a century of prohibition, Canada has become the second country in the world, after Uruguay, to fully legalize the use of cannabis. 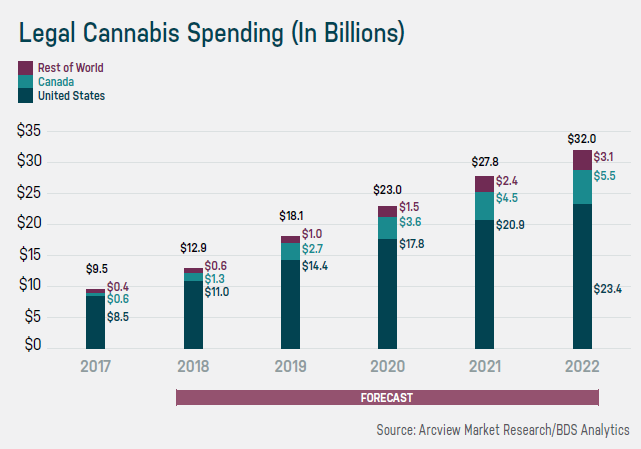 Accounting firm Deloitte estimates legal marijuana is expected to become more than a $6bn business in Canada in 2019, with up to $4.34bn coming from the legal recreational market and as much as $1.79bn from medical sales. 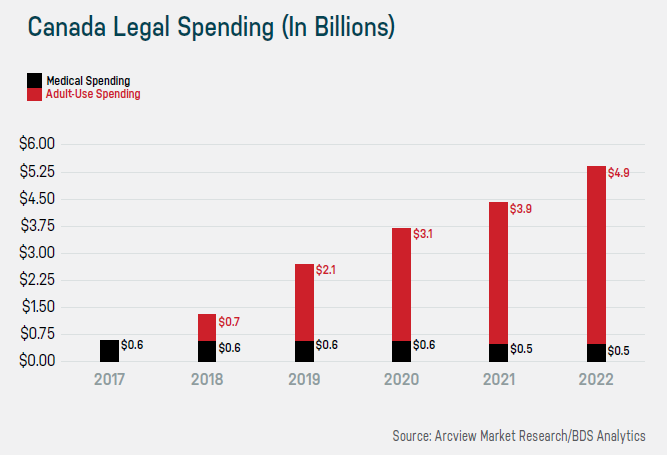 The global legal medical cannabis market alone could be worth more than $50bn by 2025. The dizzying numbers surrounding Canada’s ‘green rush’ has triggered interest across Asia as hardliners soften their attitudes towards cannabis use, incentivized by the potential economic impact of legalizing the weed in their countries. Sri Lanka will begin cultivating cannabis for medical purposes later this year. Farmers will be hired by the state to cultivate the cannabis, and production will be overseen by the military. Cannabis prohibition was initiated by British colonizers in Sri Lanka (then called Ceylon) in the late nineteenth and earlier twentieth century. Thailand’s National Legislative Assembly (NLA) is currently drafting a new bill to remove marijuana from the Category 5 Narcotics list. But it will only apply use for medical purposes. The law is expected to be passed as law in April 2019, making Thailand the first Asian country to legalize medical cannabis and they will be competing in the market led by the US and Canada. The country’s Governmental Pharmaceutical Organisation (GPO) has also begun researching mass-producing medicines from the drug. While 72% of Thais support the move to legalize weed for medical purposes, a Nida poll found half said it should be restricted to hospital use. Back in the 1980s, Thailand used to be the world’s top exporter of illegal cannabis. The challenge for Malaysia, which still imposes strict punishment for some drug trafficking offenses, is how to draft new laws that are specific enough to differentiate marijuana for medical as opposed to recreational and other uses. The Ministry of Health, which has the final say, remains skeptical about the medicinal value of cannabis. The country’s cabinet was reported to have “very briefly” discussed its medical value last month. Land and Natural Resources Xavier Jayakumar described getting cabinet support for medical marijuana use as an uphill battle. “My own personal view is that if it’s got medicinal value, then it can be a controlled item that can be used by Ministry of Health for prescription purposes,” he said. Despite President Rodrigo Duterte’s bloody war on drugs that claimed the lives of thousands since mid-2016, the Philippines committee on Health in March last year endorsed the use of medical marijuana. House Bill 180 prescribes the rules for the proper use of medical marijuana, including the designation of a qualified medical cannabis physician, a medical cannabis patient who shall be issued an identification card, a qualified medical cannabis caregiver and a qualified medical cannabis compassionate centre. Lawmaker Rep. Seth Jalosjos believes legalizing marijuana for medical use, has the backing of the Philippine Cancer Society, “will benefit thousands of patients suffering from serious and debilitating diseases”. Medical marijuana has been frowned upon by Filipino leaders in the past, but Albano feels confident that his Bill will pass with Duterte in power. The usage of marijuana is rooted in ancient literature and Hindu mythology. Despite its illegality, it is well documented that marijuana is grown in many parts of the country, especially in villages in Himachal Pradesh and in the Indian Himalayas. Cannabis cultivation and trade are partially restricted in India. While its cultivation for industrial purposes (i.e. obtaining fibre such as industrial hemp or for horticultural use) is allowed, consuming it could lead to a jail term of six months or a hefty fine. Earlier this year Uttarakhand became the first State in the country to allow commercial cultivation of hemp crop. Yoga guru Baba Ramdev, whose Patanjali company, has already made a fortune selling ayurveda-based face cleansers, toothpaste, and detergents is now looking to cannabis as a growth avenue. “There exists a huge market for cannabis in India. A lot of scientific research needs to be done, especially for those who are framing the laws,” said Yash Kotak, founder and director of Mumbai-based startup, The Bombay Hemp Company, which is backed by industrialist Ratan Tata. While cannabis remains illegal in the People’s Republic of China, the country itself produces 50% of the world’s supply. China’s crops are largely hemp, and thus the non-psychotropic and fiber-rich variety of cannabis. As of 2017, Chinese companies have 309 out of the 606 patents filed around the world that relate to cannabis. So while cannabis remains illegal in the People’s Republic of China, its massive economic potential poses a threat to cannabis interests around the world. In Hong Kong, manufacturing cannabis or any other drug included in the city’s Dangerous Drugs Ordinance is deemed the most serious of all drug-related offenses. Any person who cultivates any plant of the genus cannabis faces an HK$100,000 fine and 15 years in prison. For China’s pot to make a significant impression on the Western canna-economy, there must be state-approved logistics for global distribution and permissive banking regulations, experts say.